If you follow me on social media, you’ll know that I was lucky enough to spend Christmas in England last year. Part of this trip was to visit family – I grew up in England, and all of my family still lives there – but we also got to explore some new parts of the country together as a family, including weekends in Bath and in London, and checked out some kid-friendly activities where my parents live in Stratford-upon-Avon. Read through my recap of our lovely family trip here, and if you’d like to read more on how I prepare my kids for international travel read this post with all the details! Although my husband joined us for the second part of the trip, the first portion was just myself and the kids. This meant I got to experience my first flight with the two little ones on my own, and let me say, that was quite the experience! We flew from Orlando into Newark, then a quick 2-hour layover before flying from Newark into Birmingham International; in total, 10 hours travel time and 4249 miles. 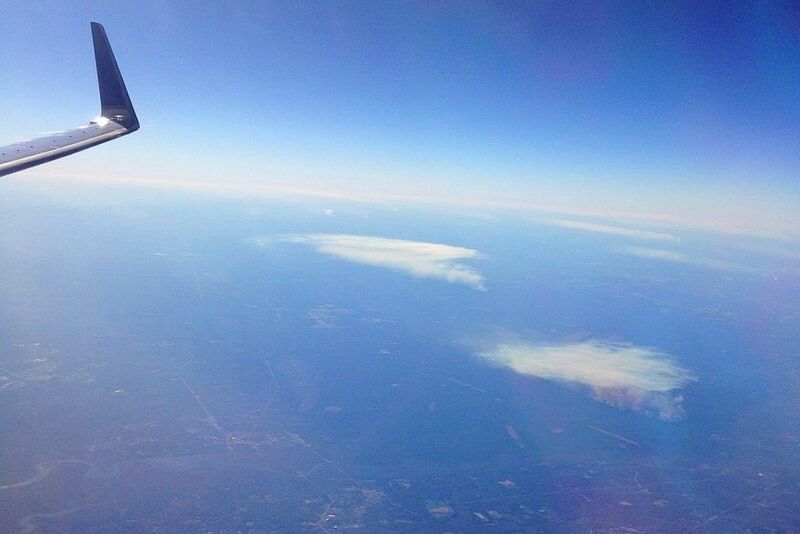 We flew with United Airlines, who are typically our go-to airline when we travel to England. One of the reasons we love this airline is that they are quick to make things right when we have travel issues (and we always seem to have travel issues!) and the flight attendants are always helpful and friendly when we travel with the kids. This trip was no exception; when the flight attendants saw me coming down the jet way with an overexcited 4-year old, an 8-month old baby, two strollers, a car seat, several carry-on bags (and a partridge in a pear tree! ), they were quick to offer assistance. We splurged on this trip and flew first class, giving us a little more space since Grayson was sitting on my lap, and this gave us the opportunity to try United’s new Polaris product. The food, bedding, and amenities, as well as the extra space and the quieter cabin, made the experience so much less stressful, and I’m happy to say that we all survived the flights with no tears or tantrums (from us as well as the other passengers!) Our boys are both seasoned travelers and I always hope that they’ll do well, but each time I’m so relieved to get off the plane without having been that passenger with the screaming baby! Visiting England in December, we knew it was going to be colder than we’re used to in Florida (pretty much everywhere is colder than we’re used to in Florida!) I have to say, we were pleasantly surprised with relatively mild temperatures, in the mid-40’s most days, and very little rain. Over the course of three weeks, we had maybe one or two days of rain, and only a handful of days were temperatures dropped below freezing. Since Grayson was only 8-months old, I was worried about him getting cold, but found an all-in-one snowsuit kept him warm whenever we were outside. 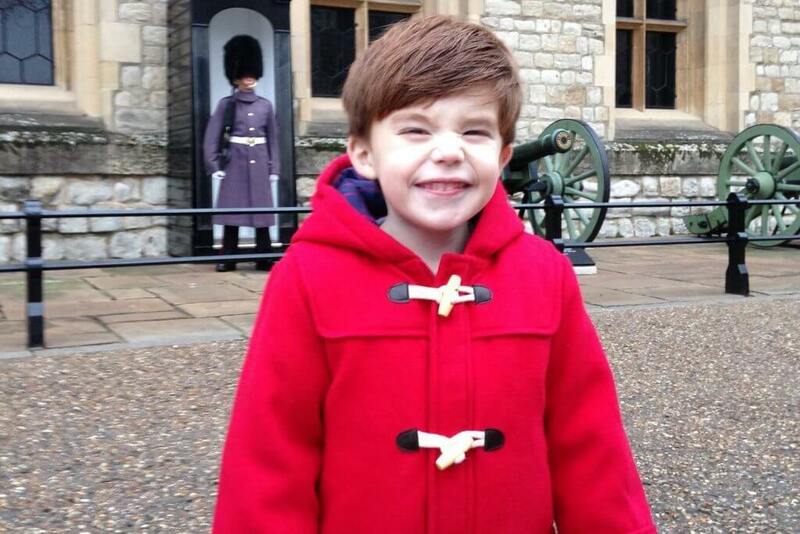 Harrison also had his very first winter coat this year – again, something we don’t need in Florida! – and I absolutely loved it, he never complained of being cold. Harrison’s first ever winter coat! 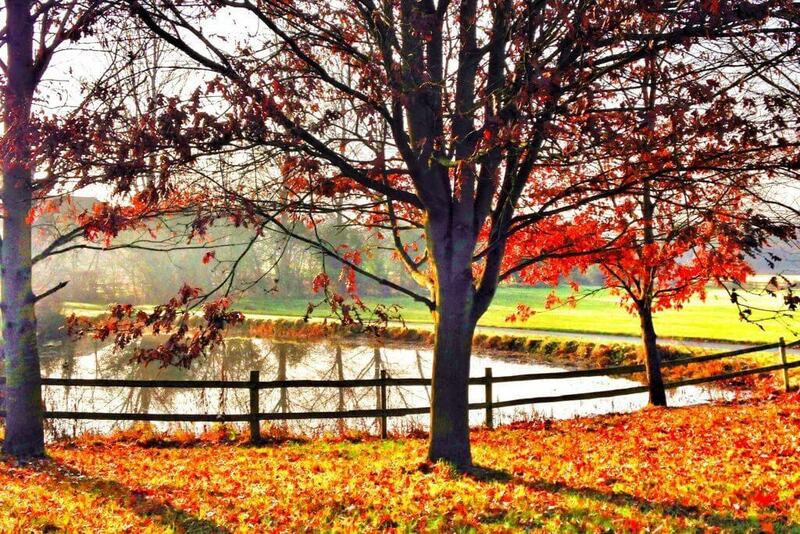 My family lives close to Stratford-upon-Avon, and this is a beautiful place to visit. Located in the center of the country, about two hours north of London, Stratford was the birthplace of William Shakespeare (in case you were wondering where you’d heard the name before, that’s probably it!) We spent some time in the town center, and found an amazing playground at The Recreation Ground, with climbing structures, slides, swings, a sand box, a zip line, and much more. There was also a public kids pool that would be perfect for the summer. The playground was a short walk from the town center, where we were able to walk along the river and feed the swans; Grayson thinks ducks are the funniest thing ever, so he loved this! The town was beautifully decorated for Christmas, and the lights were spectacular. Just outside of Stratford, we found some other activities for kids. Umberslade Farm Park in Tanworth-in-Adren is a working farm with all manner of farm animals to visit and interact with. Every hour there was a new activity for the kids, including Harrison’s personal favorite, feeding the goats! There are also two huge outdoor playgrounds and an indoor playground, as well as a sandbox, cafe and gift shop. Being Christmas, there was also a live nativity play featuring the (rather reluctant) animals from the farm! Another place we braved the outdoors was Hatton Country World in Warwickshire. This is a huge complex with shopping, farm animals, indoor and outdoor play areas, trampolines, laser combat, and much more. The indoor play area was awesome, with some of the coolest slides I’ve ever seen (as a side note, my husband braved one of the slides and declared that it was most certainly NOT for adults!) We also watched a puppet show, petted some very cute guinea pigs, and drove around on little miniature tractors. On the days when it was either too cold or too wet (or both!) to be outdoors, we kept finding ourselves back at Imagination Street in Redditch. This was a five story indoor play area with separate areas for kids of all different ages. Harrison had a field day running, climbing, swinging and sliding, and best of all, it completely wore him out! Grayson wasn’t quite crawling, but enjoyed sitting/laying/drooling in the baby area where there were lots of bright colors and interesting textures to entertain him. There were also bookcases for the kids to read, train tables, arcade games, and a cafe for food and drinks. If you ask Harrison what his favorite thing was from this trip, he would definitely say this! We spent a long weekend in the beautiful city of Bath, which was somewhere brand new to me. The city is in the southwest of England, and has an amazing history to it. The Romans developed Bath as a city of recreation, and built the famous Roman Baths for medicinal and relaxation purposes. The Roman Baths are extremely well preserved, and attracts over one million visitors a year. There are plenty of things for families to do, including tours designed just for children, costumed characters to teach them about the history of the baths, and seasonal special activities. Find out more about visiting the Baths, as well as pricing and visiting hours, at their official website. We chose not to stay in the city center, but just on the outskirts at a little Bed and Breakfast called The Wheelwrights Arms. You would need a car to stay here, since it’s a few minutes drive into the city, and the B&B is down some small country lanes, but this place was absolutely delightful. It is comprised of small cottages, with a pub next door, located on the side of a small hill overlooking a valley; in other words, the views were picture perfect! The rooms were spacious and clean, with little touches like jars of sweets and hot chocolate that really made it feel homely. The food in the pub was wonderful, especially the cooked-to-order breakfasts (my first time trying kippers, and they were so good!) The staff were extremely accommodating, and offered everything we needed to travel with a baby. We really did love it here! The first thing we did on this trip was take a bus ride to familiarize ourselves with the city. We used the Bath City Sightseeing bus tour, which is a hop-on, hop-off style tour with audio narration explaining more about the city’s history. Children under 5 ride for free, and the tickets are good for 24 hours (we bought ours at lunchtime on one day, and then were able to use them right through until lunchtime the next day.) We took the full tour the first time so we could see the whole city, and Harrison was in his element! He loves buses and we don’t have double-decker buses, or open top buses, in Florida. He loved sitting at the front of the bus, watching the city go by, and pretending to drive! We also found the most amazing playground in the city at the Royal Victoria Park. This playground is huge! There are about 15 different play structures for children of all ages, as well as swings, a zip line, a sand box with diggers, and the tallest slide I’ve ever seen! There was plenty of room for the little ones to run around and play, and even on a cold winter day, there were lots of families there enjoying the park. There was also a cafe and restrooms with baby changing facilities. We were at the park for about two hours, and I can only imagine how amazing it must be in the summer! 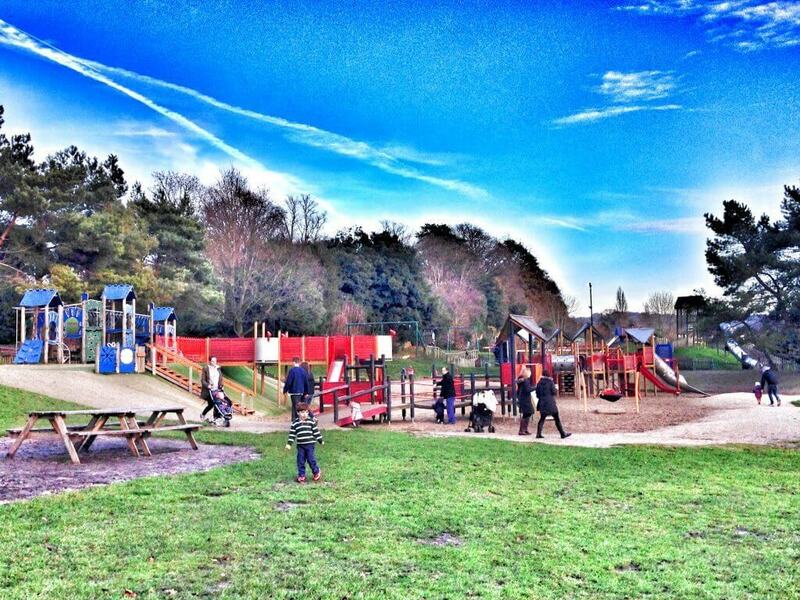 The incredible Royal Victoria Park in Bath – this isn’t even half of the playground! We decided to leave Grayson at my parents house to spend some one-on-one time with Harrison on our trip to London. I’ve never seen London at Christmas and I was so excited to soak in the festive atmosphere and see all of the beautiful lights. I had no idea how Harrison would handle all of the walking involved, since he’s only 4, but he did pretty well and we tried to use public transportation as much as possible. We used the buses more than anything since my little traveler is such a fan, and didn’t find the traffic to be too bad. We braved the tube system too, although I have to say that was a bit more daunting with a little one, and would probably be a nightmare if you had a stroller! Overall, I think using buses and walking is what worked best for us. 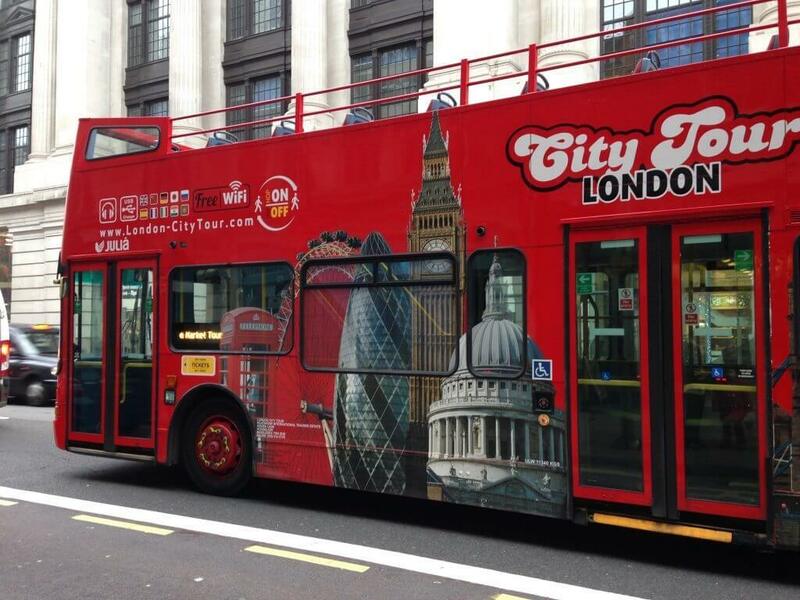 If you’re planning to use buses in London and think you’ll be hitting the major tourist sites then consider getting a City Hop-on-Hop-off bus pass; you’ll be able to get around as cheaply as possible while listening to a narration of what you’re seeing as you ride by. We stayed at the DoubleTree West End Hotel, and enjoyed our stay very much. We chose the hotel for its location; not because it was central, but the exact opposite in fact! Visiting a couple of weeks before Christmas, the city was crazy busy, and we knew that trying to get buses, tubes, cabs, etc in the city center would be really difficult. Instead, we chose to stay a little further out, and never had to deal with crowded transportation. The hotel itself was clean and modern, and the staff were all very friendly; we received the roll away bed we requested very quickly, and the housekeeper brought my son a little teddy bear to say thank you for staying with them. As Hilton Honors members, we received a free hot buffet breakfast, which was great quality and very welcome on a cold winters day. I wouldn’t hesitate to stay at this location again. The highlight of our trip to London was visiting the Tower of London. I’ve never been, and I thought this was somewhere Harrison would really get a kick out of. The Tower of London was built in 1066, and is located on the banks of the River Thames. It is comprised of several buildings, and the main tower that is usually shown in pictures is called the White Tower. Originally built as a royal palace and defense system, it now houses the Crown Jewels of England, as well as a number of historic exhibits. We had two main goals on our short visit; to see the Crown Jewels, and to find a soldier (I’ll let you guess which goal was mine and which was Harrison’s!) We didn’t have time on this trip to visit Buckingham Palace or see the Queen’s Guard, so this was our only chance to find a soldier! We hit the jackpot, and found two soldiers guarding various parts of the Tower. The Crown Jewels, while spectacular, were actually very hard to get a good look at on a busy day, and I think I’ll have to go back when it’s a bit quieter. We also climbed up to one of the Tower walls to look over the River Thames and the London Tower Bridge, which was a gorgeous view. You could easily spend a whole day at the Tower of London as a family, so be sure to look at their website for more information on planning your trip. – you can pick up tickets for the Tower of London and other major attractions here. The reason for us going to London in the first place was actually to see The Snowman on stage at the Peacock Theatre. The Snowman was one of my favorite Christmas movies growing up, and Harrison has just reached the age where he is old enough to sit in a theater quietly to watch a show. The production was definitely catered towards children, but was incredibly well done with great acting, music, and dancing, and the kids in the audience all seemed to love it. Harrison really enjoyed the show, and now I can’t wait to take him to other musicals! It wouldn’t be Christmas without visiting a Christmas market! We chose the Christmas market in Leicester Square (mainly because we walked into it by accident!) and it was delightfully festive! There was a grotto where you could meet Santa, all manner of festive food, drinks, and sweets, and some amazing stalls selling homemade products that would make great last minute Christmas gifts (I loved the wood carvings!) We picked up some hot chocolate, a German pastry or two, and took a stroll through the market, just taking in the festive atmosphere. It was the perfect way to spend a December evening! Our favorite way to get around London! 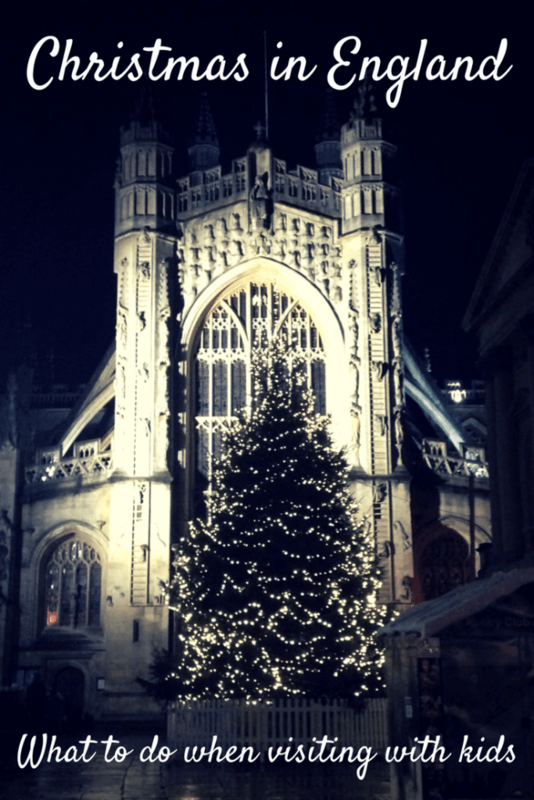 Spending Christmas in England was such a treat, and I can’t wait to go back again! This Florida girl got her cold fix, and visiting different parts of the country to see their festive offerings really put me in the Christmas mood! Have you been to England over Christmas? What did you do, and what would you recommend for my next visit? This is awesome!! You’re so brave to take the kids by yourself so far! What beautiful memories!! Thank you! Traveling alone with the kids is actually a lot more scary leading up to the trip than once you’re actually on your way!